Amazing progress has been made this year toward prolonging the lives of patients with advanced skin cancer. In March the U.S. Food and Drug Administration approved Bristol-Myers Squibb’s injectable drug Yervoy, which was found to extend the lives of end-stage melanoma patients an average of 10 months. In a study which was presented on June 5 at a meeting of the American Society of Clinical Oncology, another drug, vemurafenib, was revealed to have a 63% reduction in the risk of death compared to patients given the chemotherapy drug dacarbazine. 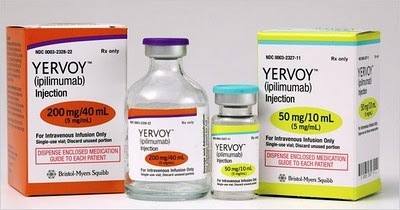 Unlike chemotherapy, which attacks cancer cells with chemicals, Yervoy belongs to a novel class of immuno-therapy drugs that work by mobilizing the body’s immune system to destroy the cancer. Vemurafenib is a so-called targeted therapy which counteracts the effect of a mutation in a gene called B-RAF that causes tumors to grow and spread. Some observers believed that prolonging the life of patients with metastatic melanoma as much as two years is not significant. “Two years is nothing when you’re 30,” said Dr. Anna C. Pavlick, head of the melanoma program at New York University. However, many doctors and patient groups welcomed the progress because until now treatment of melanoma that had spread beyond the skin to other organs was uncontrollable. “Late-stage melanoma is devastating, with very few treatment options for patients, none of which previously prolonged a patient’s life,” Richard Pazdur, MD, director of the FDA’s cancer drugs office, said in a news release. The number of melanoma cases has been rising steadily, unlike for many other types of cancer. Doctors say this is because of unprotected sun exposure and the proliferation of tanning salons. More than 68,000 people in the United States and 160,000 worldwide are diagnosed with melanoma each year, according to the American Cancer Society. The five-year survival rate for the aggressive cancer is just 15%. These two new drugs, with possible rare exceptions, do not cure melanoma. More than half of patients with the disease will not be helped much or at all by either drug. Experts say more needs to be done, especially since melanoma affects more young adults than many other types of cancer. Brand-new Schiller AT-2 Plus EKG at an amazing price of $1,999.00 – while supplies last. Alphanumeric keyboard 6/12 channel representation of all 12 simultaneously acquired leads; large, high resolution backlit monitor for easy preview of ECG quality; automatic and manual mode; fullsize 8 ½” x 11” reports; integrated rechargeable battery lasts up to 3 hours or normal use. Read more. Resting ECG system whose true one-button operation makes it especially suitable for routine use in private practice, emergency medicine or hospitals; standard, built-in battery; independent battery operation together with the electrode application system KISS with device-integrated suction pump (optional); brilliant graphic display where 12 leads can be displayed quickly in 3-lead sequences. Read more. Automatic, manual or 12-lead rhythm operation for maximum flexibility; advanced functionality in a compact package; easy-to-use keyboard and menu driven interface; optional, powerful interpretation algorithm based on five clinically significant criteria, as well as pediatric analysis and pacemaker enhancement. Read more. Ganim Medical's selection of pre-owned and refurbished medical equipment and furniture can save you hundreds, sometimes thousands of dollars over purchasing new. Click on the above image to view our product offer. 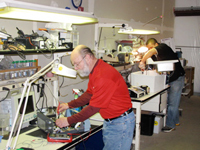 Our biomedical engineering technicians are highly skilled specialists who not only repair medical equipment but also take preventive measures to ensure that your equipment doesn't malfunction at critical moments. Click on the above image for more information.